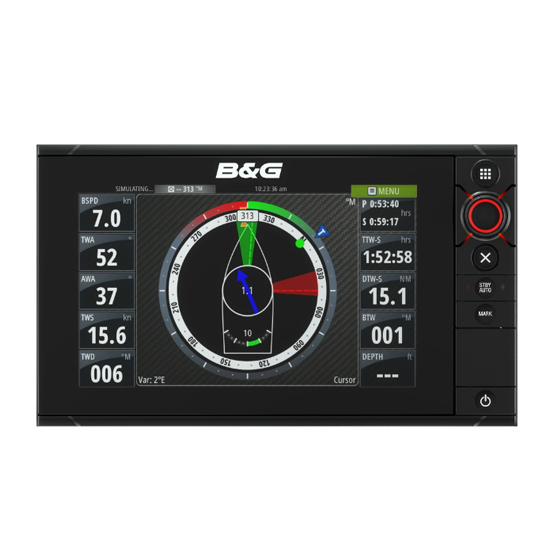 The B&G Zeus2 is an easy to use, ultra-responsive chartplotter designed specifically for sailors. It is packed with exclusive sailing features including Laylines (view tacking angles on the chart even without an active waypoint), SailSteer (all your sailing data on one display), SailTime (more accurate ETAs for sailing boats that can’t follow a direct route), GoFree™, GRIB weather, WindPlot, enhanced tides (internal tidal calculations with Navionics Dynamic Tides and Currents data) and much more. It has a bright, 9-inch LED backlit widescreen display with multi-touch ‘pinch-to-zoom’ interaction, supplying dedicated sailing data at the tip of your finger backed up by B&G’s signature rotary controller. Zeus2 features an ultra-low profile design and is built to weather the elements, blending style with performance in the toughest environments. Zeus2 integrates seamlessly with your existing network, communicating with performance modules including Broadband Radar, Pilot, AIS, Digital Switching and more. It contains a high-performance GPS antenna or interfaces with the optional B&G ZG100 10Hz GPS. It has an intuitive menu system and features B&G’s fastest processor for seamless chart redraw and the sharpest graphics. The SailSteer navigation screen displays Heading and COG, Current Layline, Calculated Tide, True Wind Angle Indicator, Rudder Angle Indicator and Opposite Tack Layline amongst other features to improve on-water navigation and maximize sailing success. All data is shown relative to the boat for easy and accurate visualization. Zeus2 is compatible with leading cartography options, including Navionics, Insight and C-Map, which can be installed via the plotter’s convenient dual chart slot, giving sailors the ultimate choice of the level of detail they need for confident, expert navigation on the water. Spend more time enjoying the water and less at the chart table with GoFreeTM, B&G’s powerful wireless solution to remotely control and view Zeus2 via your tablet computer, or view via your smartphone, wherever you are (WiFi-1 Module required).